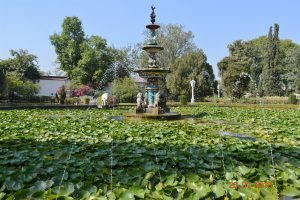 Weekend Getaway from Gurgaon to The city of Lakes!! 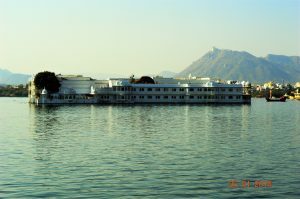 I finally booked the ticket of my long due trip to be made; Udaipur- popularly known as “The city of Lakes”. Mode of transport from Gurgaon/Delhi would be either via Flight, Train or Bus. Whatever mode you want to take make sure to book well in advance. The flight tickets will be sky high on long weekends and also if you wait till the end moment; train tickets will be next to impossible and you might have to wait to do the tatkal booking. Last option you’ll be left with is to take the bus. I had booked a train ticket to and fro. 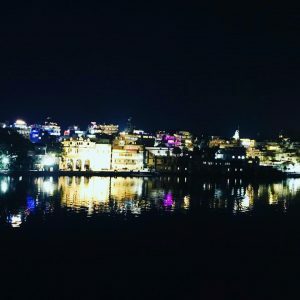 Udaipur – I’m lacking words to express. Most Vibrant, Serene, Romantic, Whimsical, this city has a lot to offer!! 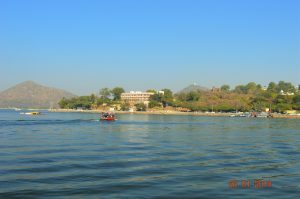 Since my hotel was in a walking distance to Fateh Sagar Lake, I walked to take a boat ride. The cost of taking a boat ride is Rs200 for 20mins around the lake. You also have an option to opt for a speed boat, again for Rs200 but that will be for 5mins around the lake. It was a beautiful start of the day. 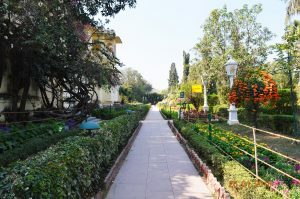 After taking the ride I went ahead to visit Saheliyon Ki Bari – “Garden of Maids”. This extensive garden is full of natural beauty. You will love strolling around the garden, taking pictures and enjoying its beauty. I then headed to visit City Palace. 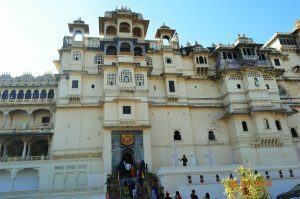 The entry fee for City Palace is Rs330. It is usually very crowded; hence you might have to stand in a queue to purchase the ticket. Last time to get a ticket is 4:30 PM. If you wish to visit the palace make sure you keep enough time in hand and wear comfortable shoes. Ladies, I would suggest no to heels. You might have to walk a lot because the palace and the museum is extraordinarily huge!! You can explore the history and admire the architecture. Passages are very narrow and steep and it’s a one-way entry/exit. You might want to carry your camera as am sure you’ll have lot of pictures to click. I spent 3hours in and around the museum and after getting exhausted to the core, I left for my hotel at 5PM. In the evening, I went for a fine dine to Tribute Restaurant. You need to book a table well in advance as it’s difficult to get a table. 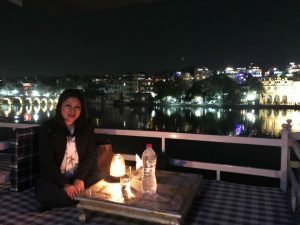 I tried booking at Leela, Oberio and Trident but not able to get through because of rush, hence ultimately I called Tribute, another fine dine restaurant and I was lucky to get a table at the lake side. The dinner was magical, listening to the soft instrumental music overlooking the lake. Food was great, the ambiance was awesome and so was the staff. It was a day spent extremely well. After reaching the hotel and while going off to sleep, I realized that I had not got enough of the beautiful place so I decided to extend my trip. 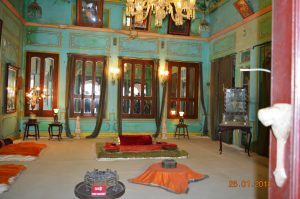 Next day I checked out from the hotel – Hotel Kalika Palace and checked in at Treebo Jheelaman. 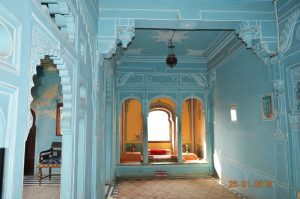 Treebo was a decent property, will suit your budget and the best part was that it was in a walking distance from City Palace. Being a solo traveller all I cared was a decent hotel at a reasonable price as I knew I would be out the entire day. 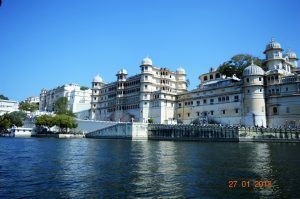 So, I checked in, dropped my baggage and headed towards City Palace to take a boat ride to Jag Mandir for lunch. The boat ride cost is Rs400, boat will drop you at Jag Mandir and you can enjoy the place, have lunch (if you want) and come back. 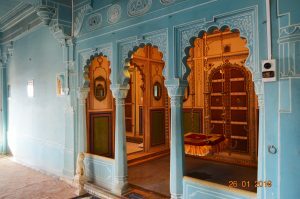 Jag mandir is situated in the middle of the Pichola lake and the only way to reach would be taking a boat. Extremely beautiful place, simply phenomenal. You have a restaurant inside where you can order your lunch if you want. They have very limited options in menu so you won’t have much to choose from. After a good lunch I took the boat back to City Palace. 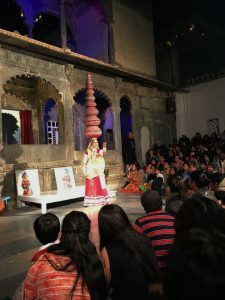 Reaching the hotel, I rested for an hour and went ahead to experience the folk dance show at Bagore ki Haveli. 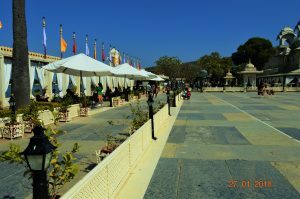 Suggestion – opt for auto while travelling in Udaipur, it’ll make your life easy. They have Uber and Ola but the wait time is very long and the roads are narrow, traffic is horrible and most of the time cabs can’t enter. Best option is taking an auto as it’ll be the easiest choice. Ticket counter opens from 6:15PM and the show begins at 7:00PM, however people get in the queue from 5:00PM. If you reach late you might not get a ticket for the first show. Show ticket is Rs60 and if you want to carry your camera you have to pay Rs150 extra. They run two shows, 7-8 and 8-9 and you have to line up at least at 5PM if you want to see the first show. I had reached on time so didn’t find it difficult to get a ticket. This show will be very crowded and it’s at the first come first basis, so if you reach early you grab a good seat else you might have difficulty is viewing the dance. 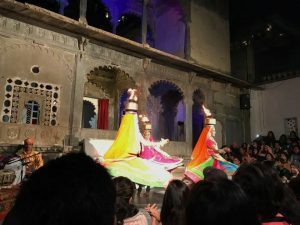 Five different traditional dances from different part of Rajasthan and all of them were mind blowing!! After the dance show was over, I went to Upre for dinner at the Lake Pichola Hotel. Unluckily, there was no table available so had to leave L, again you definitely have to book a table well in advance. I was walking to take an auto back to the hotel, I came across a roof top café nearby. I thought of sitting there and I must say it was the best decision. Very normal and not a fancy place at all but the view of the lake pichola from top was mesmerizing!! They had a lake side sitting where you could open your shoes and climb up to be seated at ease. You could view the entire lake and the City Palace at night. City was lighted and the entire view of the place was enthralling!! What a peaceful sleep I had that night. Next day I had to catch a bus at 7PM so checked-out at 1PM and headed to visit the remaining places before getting back home. 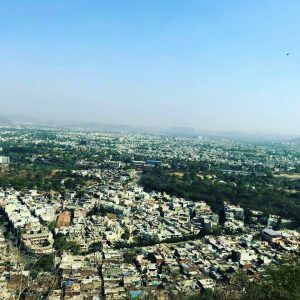 I visited Mansapurna Karni Mata Ropeway, not for any religious purpose but just to get the birds eye view of Udaipur. You purchase a ticket and get into the cable car which takes you up till the point from where you can climb to visit the temple if you want. If not, you can simply enjoy the panoramic view of the city and get back. I guess it is worth a visit, city looks beautiful from top. Last resort for the day was Monsoon Palace. Auto dropped me to the place from where we get tickets. 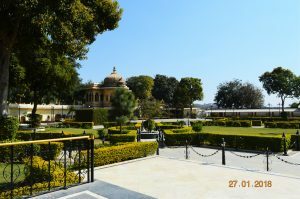 Ticket for Monsoon Palace is Rs60 and you need to buy additional ticket for cab for Rs90. In a shared vehicle they’ll take you up to the hilltop palace. 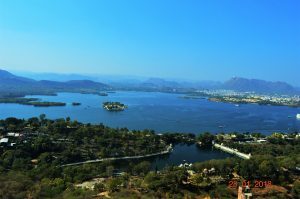 Nothing much besides it resides overlooking the Fateh Sagar Lake and you can get a panoramic view of the city. There is a restaurant in there but again not much variety. I just had pasta for lunch, went around the palace for a while and took the cab back. By that time, it was already 5PM and I spent remaining hour at Oladar Village Restaurant & Café which was near to my hotel. After sipping the final coffee, I left for the bus stand to board the bus to Gurgaon. Take auto rather than hiring a cab, your life will be easy! !